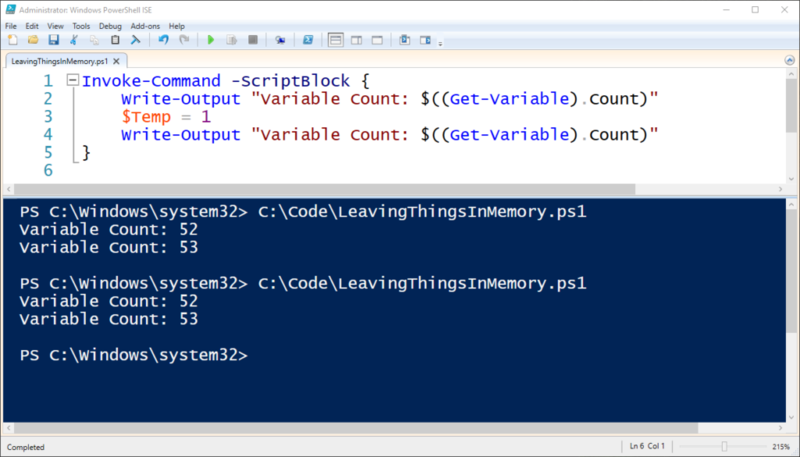 One of the features of both Visual Studio Code and the PowerShell Integrated Scripting Environment is allowing you to run a line of code with the F8 key. This is super cool and useful, but it has a side effect because to validly be able to run a specific line of code, you often need to have stored all the results up to this point. However, in both VS Code and the ISE, if you run the same code again, you might be surprised at seeing the numbers of variables cease to change. You can see, that now that we defined our code in a scriptblock, the variables do not leak out of their context and we can run our code over and over without worrying about existing variables.